D.B. Higginbotham Electric Ltd. (A.K.A. Higg Electric ) has served Virden, Manitoba, and surrounding area since 1978. We have built an impeccable reputation in the industry with an emphasis on quality. Our success is attributed to understanding our customers and exceeding their expectations. As a privately-owned company we have extensive experience providing a full range of Electrical, HVAC, Plumbing, Utility Line Locating , and Directional Drilling Services. Higg Electric has grown to be one of the largest and most diversified companies in the region. We are equipped with all of the resources and staff to tackle any job. Our customers range from commercial and residential clients, to industrial and large oilfield companies. As a result of our growth as a company, our skills are continually being tested with new challenges every day. At Higg Electric we are willing to learn what others know. We believe that success is doing the best we can, with what we have, in any situation we may be faced with. D.B. Higginbotham Electric Ltd. (A.K.A. 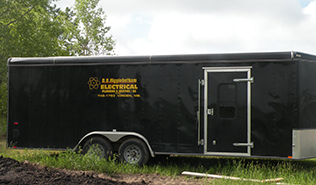 Higg Electric ) has served Virden, Manitoba, and surrounding area since 1978. We have built an impeccable reputation in the industry with an emphasis on quality. © DB Higginbotham Electric. All right reserved.